Hopefully you didn’t miss yesterday’s Tuesday Night Winner! For some reason, everytime I see Mike Leach I think of the late-great Chris Penn with dark hair...am I wrong? Around this time every year, Mike Leach's flashy squad loses to a BIG 12 powerhouse. Especially with the Red Raiders coming-off some weak victories against the rebuilding Cornhuskers (OT victory at home) and the suddenly-awful Aggies (down 3 at half before winning 43-25 in College Station), who in their warped & hazy mind would actually take the Red Raiders on the road to face the human-Blueberry this weekend? Put the women, children, & sour cream to bed folks! Just like my football, I luv things black, red, & flashy! Graham Harrell has been an absolute machine completing 78% of his passes with 15 TD & only 2 INT the last 4 weeks. While the prognosticators will tell you last week’s 1st half performance against the downward-spiraling A&M squad should raise cause for concern, I was more impressed with how they came out after halftime on both sides of ball. The defense tightening-up and didn’t allow a point in the 2nd half, while the offense showed an ability to exploit some in-game match-ups with the senior leadership of the 6-3 Harrell. This must be a sign...she reminds me of a Crabtree! While WR Michael Crabtree is still the main attraction (51 catches & 12 TD) his numbers are down from last year because of the emergence of So. Detron Lewis (40 catches at 13.4 ypc), 6-3 Fr. Tramain Swindell (last week: 7 catches & 101 yards) and a two-headed rushing attack that actually rushes the pigskin this season adding some much needed balance (So. Baron Batch & Sr. Shannon Woods - 893 yards, 6.3 avg, & 12 TD)...as well as, 56 catches & 663 yards receiving! I really hope Big Blue did this as a joke! I know the Red Raider D is still considered “Oil-Tycoon on the Paris Hilton runway strip”-easy, but their “bend-but-don’t break toooo much” has really played well when the game’s been on the line. Especially with the stamina from a full season of running on-n-off the field all day, look for a much fresher group in the 2nd half as the Jayhawks start to feel the affects of last week’s bruising contest with the Sooners. The 5-11 Jr. Jayhawk QB Todd Reesing was sacked virtually every time he dropped back in the 2nd half and looked worse than Heather Locklear’s mug-shot following the game. While Reesing & Co. have been solid once again this year, their cupcake schedule has masked a less that stellar rushing attack without last year’s stud Brandon McAnderson (1125 yards, 5.9 avg, 16 TD) as leader rusher Jake Sharp has only rushed for 386 yards at a 4.4 clip…even worse when you think that average was accumulated against Florida International, Louisiana Tech, Sam Houston St, and mostly Big 12 bottom-feeders! 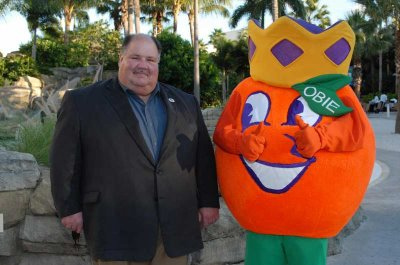 I think we know whose lunch Mangino's been stealing! As for Coach Big Blueberry’s D, let’s just say my pathetic Cyclones scored 33 points and almost pulled-off an upset against them 3 weeks ago…the same ISU squad that followed-up that game with a 38-10 loss at Baylor & a 35-7 defeat at home to Nebraska. 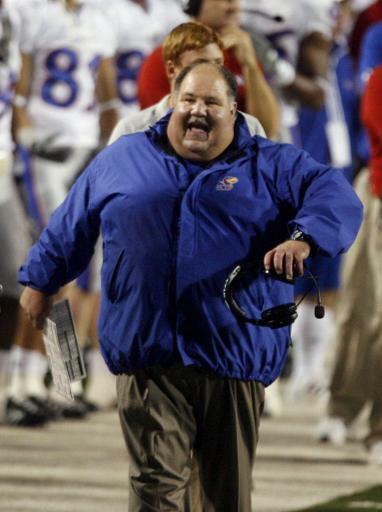 And while nobody has been able to stop Oklahoma’s Sam Bradford, he carved-up the Jayhawks secondary to the tune of 468 yards, so expect a demoralized group to look a little tentative against the Raiders spread-attack. Throw-in over 200 yards on the ground for Coach Stoops, and the whole defense should have plenty of doubt and banged-up bodies this week. Unlike this mesh shirt, Tech won't look past Kansas! And finally, I honestly believe Texas Tech was flat at different times the last few weeks because they've been looking towards this showdown with Kansas. 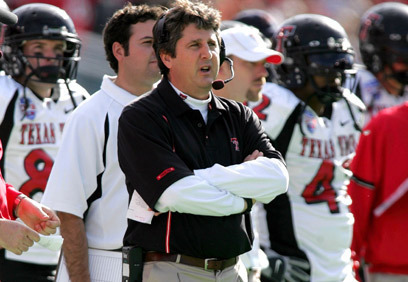 While some may say the Red Raiders will be looking at Texas next week…don’t be fooled, this is the biggest game this late in the year for the Mike Leach ERA...Guns Up Baby! This page contains a single article from October 22, 2008 1:43 PM. The previous days article was Mea Culpa Homeboys, Mea MFin Culpa!. The next days article was Thursday Night ATS Pigskin Prediction.